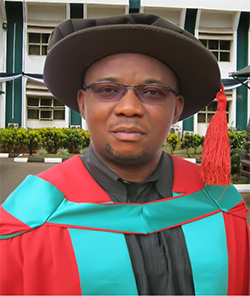 Agwu Ekwe Agwu, a Professor who teaches in the Department of Agricultural Extension University of Nigeria Nsukka is equally attached to the African Heritage Institute as an Associate Research Fellow and is currently the President, Agricultural Extension Society of Nigeria (AESON). He obtained his professional training at the University of Nigeria Nsukka where he graduated with a Bachelor of Agriculture Degree in Agricultural Extension (with First Class Honors) in 1994; a Master’s degree and Doctorate degree in 1997 and 2000, respectively. He has been involved in teaching and research in agricultural communication, rural development, extension policies and institutional reforms, as well as, agricultural innovation systems, agro technology generation, transfer and use since 1995. Professor Agwu has consulted extensively on issues of information communication technology, natural resources management; rural development, extension reforms, value chain analysis and climate change adaptation and food security (using the innovation system framework). He has published widely in national and international scholarly journals with over One Hundred (100) publications to his credit. Prof. Agwu was the Head, Department of Agricultural Extension, University of Nigeria, Nsukka; Assistant Director, External Studies, Office of the Vice Chancellor, UNN as well as a Development Officer to the Vice Chancellor of the University of Nigeria between 2009 and 2014. He is currently coordinating the dissemination of proven technologies using the Adopted Village Concept in communities around the University of Nigeria, for the West Africa Agricultural Productivity Programme (WAAPP), a World Bank assisted Programme for the countries of Economic Community of West African States (ECOWAS), under the Agricultural Research Council of Nigeria (ARCN). Prof. Agwu, who hails from Umuobuna Etiti-Uburu in Ohaozara Local Government Area of Ebonyi State, is happily married to Ebere and blessed with three children – Miracle, Destiny and Goodness.